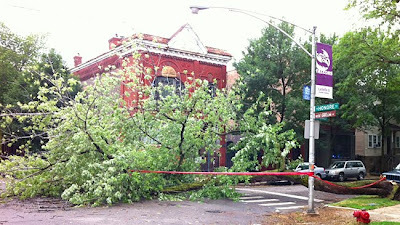 East Village Association | West Town Chicago: How does Chicago get the drop on storm damage? How does Chicago get the drop on storm damage? A downed tree this morning at Thomas and Honore is a reminder that clearing the street is just as much an issue now as in deep snowfall. 1st Ward Streets & Sanitation Supt. Manuel Gonzalez is set to talk tonight about all things handled by his department, a talk put off after the February snow emergency. Parkway landscaping, debris removal, rat control and street sweeping are also likely topics for discussion. Last summer the ward started offering street-sweeping text alerts, reminding residents by cell phone to move their cars and avoid tickets. The ward also has experimented with grid system to pick up trash. Gonzalez can explain how that works and if it might save money citywide. He's also prepared to talk about who owns trash bins, where to keep them, and how to make better use of blue recycling bins. The meeting is at 7 p.m. at the Happy Village, 1059 N. Wolcott.